The Heart of Eternity diamond is one of the ten most valuable blue diamonds ever sold. Its color, which has been rated as “Fancy Vivid Blue” is mesmerizing. Before we get into the story of the Heart of Eternity diamond itself, let’s take a look at its features, with the understanding that perfect blue diamonds like this one are extremely rare. Most blue diamonds have black undertones that detract slightly from their value. 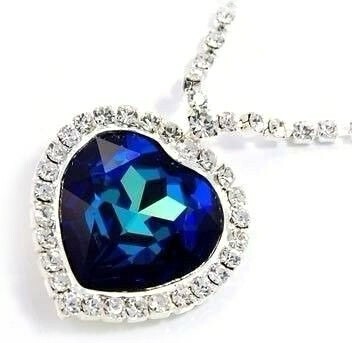 The Heart of Eternity diamond was discovered in the South African Premier Diamond Mine, which is the world’s largest supplier of blue diamonds. Despite this honor, only about 0.1% (1 of every 1,000) of the diamonds sourced here is blue – and even fewer are perfect. Of those, fewer still are large. 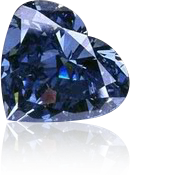 The Heart of Eternity price, which we’ll discuss momentarily, is linked directly to its size and rarity, which is on par with that of the Tavernier Blue (Hope) diamond. As the diamond’s name suggests, it has been cut into a heart shape. Most diamonds of this size are cut into interesting shapes that make the most of the stone’s natural beauty. It’s clear that Steinmetz Group, who owned the diamond before selling it to the De Beers Group, did a fantastic job shaping this precious blue stone. After purchasing the Heart of Eternity diamond from Steinmetz Group, De Beers unveiled it in 2000 as part of the De Beers Millennium Jewels collection, which included the 203.04 carat Millennium Star. Interestingly, the Millennium Star and the Heart of Eternity diamond were cut from the same rough stone, which weighed in at 777 carats at the time of its discovery. These famous diamonds and several others were the target of the Millennium Dome diamond heist, which was fortunately foiled by the Flying Squad of London’s Metropolitan Police Service. Following the Millennium exhibition, the Heart of Eternity was loaned to the Smithsonian Museum, allowing millions of people to marvel at its beauty. In 2012, reports that boxer Floyd Mayweather purchased the Heart of Eternity necklace for fiancée Shantel Jackson had the internet buzzing. Did Mayweather really present the model, with whom he later parted ways, with the Heart of Eternity necklace, or was the Christmas gift a pricey reproduction? De Beers has been tightlipped about whom they sold the Heart of Eternity Diamond to, and it’s hard to say whether gossip concerning the existence of a Heart of Eternity necklace is true. In order to determine the Heart of Eternity Price, based only on its monetary value per carat, we multiplied its size (27.64 carats) by $580,000. This rate is a modest one, as we have not accounted for inflation since the January, 2000 rates published during a sale of exceedingly rare blue colored diamonds. Using these figures, we determined that a modest estimate of the Heart of Eternity price is $16,031,200 USD. As this is highly rare, unique gemstone, and as no current appraisal figures are available, its actual value is unknown.